The first Sunday of the Great Fast is called the Sunday of Orthodoxy. 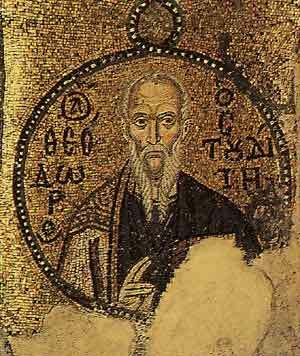 On this day, the holy Church commemorates the victory of Orthodoxy over heresies. As a loving guide, the Church invites its faithful children to venerate and honour in piety the holy Icons of the Saviour, the Mother of God, the Saints, and to contemplate the wisdom behind all creation. we depict it in word and deed. The Seventh Ecumenical Council (Nicaea in 787 AD) declared: ‘Icons do with colour what Scripture does with words’. This is a clear recognition both of how icons work, but also of how Scripture works. Icons are windows – they make it possible to see beyond them to something else; beyond oneself and further than one’s “common sense” would ever take them. Knowing how to read an Icon, how to see what is shown by God, requires far more than common sense. It requires a pure heart – it requires a loving relationship with both God, His people, and with creation. The Church now testifies, within history, to God, whom philosophers conceived as a mere idea. We do not believe in a God who is merely an idea. We believe in a God who, out of such love for humanity, became Himself a human being, in order to teach true humanness; because the entirety of true humanness leads to deification (theosis). At the start of the eighth century in the salvation history of the Church there began a catastrophe that continued for more than a hundred years, from 727-843 AD. A cruel persecution arose against the holy Icons and those who venerated them. The holy vessels used in the celebration of divine services were destroyed because the Saints were depicted on them. Everywhere holy Icons were removed, taken from the churches and cast into rivers or burnt. Like Moses, the Prophets, and the early Christians who ‘suffered mocking and scourging, and even chains and imprisonment’ (Heb 11:36) for upholding their faith, so too the defenders of the veneration of Icons were subjected to all possible kinds of persecution, even death. But they courageously chose to ‘share ill-treatment with the people of God than to enjoy the fleeting pleasures of sin’ (Heb 11:25), not accepting the heresy of the iconoclast’s (those who destroy religious symbols falsely claiming they are idolatrous). At that time many bishops, priests and others were tortured for venerating and praying before the holy Icons. We do not worship the paint and wood of the Icon, but the grace of Him who took human form, in order to bring consolation to the chaos that we make. The iconoclast’s could not grasp the meaning of the Icon; they could not taste and see what the eyes of the faithful could see and taste through the Icon, that the Lord is good. For whoever rejects the Icon rejects the Incarnation. Can anyone be a Christian while denying the Incarnation of Christ? A faithful person can taste immortality through their mortality. This is because to the faithful person, the Icon is inextricably connected with the unveiling in the Church’s consciousness of the meaning of the Incarnation: the fullness of the Godhead that dwells corporeally/bodily in Christ. No one has ever seen God, but the Man Christ reveals Him in full. In today’s gospel Christ said, ‘Truly, truly, I say to you, you will see heaven opened, and the angels of God ascending and descending upon the Son of man’ (Jn. 1:51). The reference evokes the image in Genesis 28:12, where Jacob saw a ladder. By using this Icon, Jesus indicates that He is the One through whom humanity will find access to heaven. He is the revelation of the Father on earth. Through Him, heaven will be permanently opened and salvation made accessible to humanity. In Him, God becomes visible since He appeared. It also means that He also becomes describable. The faithful have not imagined Him, they have seen Him, not just His miracles, but Him! An image of the Man Jesus is therefore an image of God, for Christ is the God-Man (Theanthropos). The Icon therefore, reveals a message at the level of the profundity of the dogma of Chalcedon in the 5th century (the 4th Ecumenical Council 451) which affirmed the two natures of Christ being present from one and the same person. It confessed one and the same Son, our Lord Jesus Christ: the same perfect in divinity and perfect in humanity, the same truly God and truly man of a rational soul and a body; consubstantial with the Father as regards His divinity, and the same consubstantial with us as regards His humanity; like us in all respects except for sin. Therefore, in the person of Jesus Christ a new dimension is offered to humanity, and human art. The Icon reminds us of God as the Prototype in whose image and likeness every human being is created. The saints are witnesses and examples of human beings who have reached the likeness (theosis) of God by joining their free will to His will. The theological significance of the icon is that it speaks in the language of art about dogmatic truths revealed to human beings in Holy Scripture and Church Tradition. On the 19 February in the year 842, after the last enemy of the veneration of icons finished his days in horrible torment, the Empress Theodora, wife of the Iconoclast Emperor Theophilus, and Irene the Athenian, put an end to the persecution and unrest, restoring the veneration of the Icon. At Theodora’s command on the forthcoming first Sunday of the Great Fast, the Patriarch Methodius in a solemn procession, accompanied by a multitude of joyful Orthodox faithful, entered the Hagia Sophia in Constantinople and offered a prayer of thanksgiving to God for the restoration of the veneration of Icons. The blood-shed by the holy martyrs for upholding their faith was victorious and the torments of the Church were triumphant. Truly, in the words of the Apostle John, ‘this is the victory that overcomes the world, our faith’ (1Jn 5:4). Some people reproach the Orthodox unjustly for their worship of the one true God through sacred images. But, if a person consisted of spirit alone, if one had no body, then during worship services there would be no need for visual representations of unseen things. But since we are clothed in flesh, it is natural to require visual objects to influence our souls through our bodies and stimulate a prayerful attitude. Bowing reverently before visual sacred images, the soul of the Orthodox Christian is elevated in spirit to its Prototype. After all, icons are only a representation of the true God in the form in which He revealed Himself to humanity. And who of the mindful children of the Church does not experience the strength of grace from the holy icons as a visual representation of the Lord, the Mother of God and His Saints? Standing before an Icon, we are spontaneously lifted in spirit to that very personage depicted as a living person, we are inevitably reminded of the saint’s virtue and life of piety, of the grace of God which worked and works in them still. Standing before an Icon we are transported in spirit to another, higher world, where all is pure and holy. We reject this vain and sinful worldliness, and are elevated in mind and spirit. Our heart is filled with joyful thanksgiving to the Lord. We stand in front of the Icon and feel that our joy is made stronger through communion with the depicted saint as a living intercessor for us before the throne of grace. If we experience sadness in our lives, we stand before the holy image and feel spontaneous relief in our hearts, because before our eyes our heavenly comforter actually stands in front of us, praying to God, always ready to help us in the fullness of love of his pure and sanctified spirit. The Church as the Body of Christ and the source of our Faith is the Icon and presence of Christ in the world as we speak. It is that holy foundation made by the Incarnate Word of God for the salvation and sanctification of humanity. It bears His own authority and authenticity, made up of men and women sharing one common Faith and all its Mysteries, who consist of laity and clergy, with the latter supervising the Church under the Grace and leadership of Christ, trace their beginning in unbroken succession to the Apostles and through them to the Lord.